The little known story of how a Hastings lifeboat capsized under Fairlight cliffs throwing two lifeboatmen into a stormy see has been revealed. 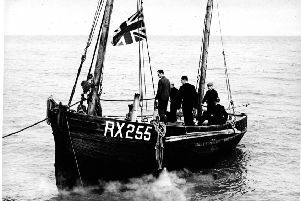 The capsize of the Cyril and Lilian Bishop Lifeboat on November 17 1944 never hit the headlines, with the RNLI asking the Hastings Observer editor of the time to play the incident down as they did not want local people to lose faith in the lifeboat. Instead it was reported briefly as ‘an incident’. But the capsize was the subject of a special dinner event at East Hastings Sea Angling Club on Sunday which raised enough funds to pay for the insurance costs and maintenance on the two restored Hastings lifeboats, which are displayed in the Old Town. The event was organised by Deeday White and Tush Hamilton and attended by the Hastings Mayor and Deputy Mayor. The club provided a carvery for guests and guest speaker was local author Geoff Hutchinson, who has written a book on the Mary Stanford lifeboat disaster at Rye. Master of ceremonies for the evening was Hastings Town Crier John Bartholomew. Deeday White said: “The evening was a great success and sold out in advance very quickly. I would like to thank the Club for making everyone so welcome and putting on a nice carvery. It will help with the upkeep of our two historic lifeboats. In next week’s Observer you will be able to read in full about the dramatic capsize and how the lifeboatmen got the boat afloat. See also: Main jailed after taking knife into the Conquest Hospital. See also: Meeting Father Christmas in his Hastings Grotto: Everything you need to know.